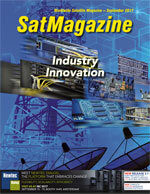 by Joseph Campagna, Senior Vice President, Operations, BridgeSat Inc.
BridgeSat has broken ground on a global Optical Communications Ground Network (OCGN) that is ideally suited to meet the needs of upcoming LEO satellite operators. 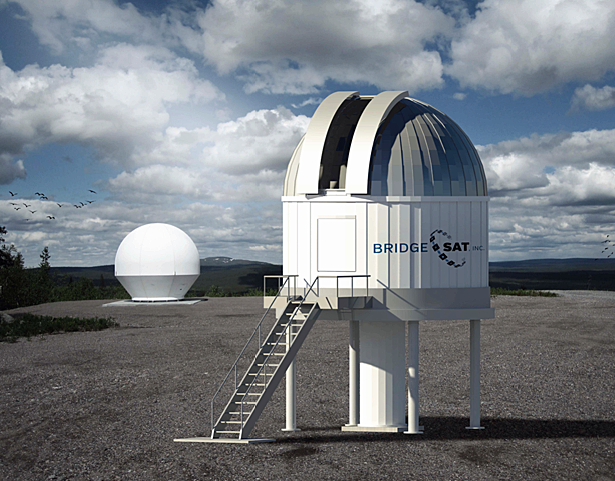 An artistic rendition of the completed BridgeSat Optical Ground Station in Kiruna, Sweden. Image is courtesy of BridgeSat. The OCGN consists of multiple Optical Ground Stations (OGS) that are remotely monitored and controlled from BridgeSat’s Network Operations Center (NOC) and connected through a network/cloud domain to the satellite operators. BridgeSat is working in partnership with Swedish Space Corporation (SSC) and a host of leading suppliers to develop this network in time for Final Operational Capability (FOC) in early 2019. BridgeSat’s OCGN was initially sized to meet the needs of LEO Earth Observations satellites that generate more data than can be downlinked, due to power limitations, a general paucity of available (RF) spectrum, variable pass durations and limited access to ground stations. Currently, 27 percent of smallsat Earth Observation (EO) missions generate more data than they are able to downlink and this problem is only going to get worse, according to a study by Northern Sky Research. 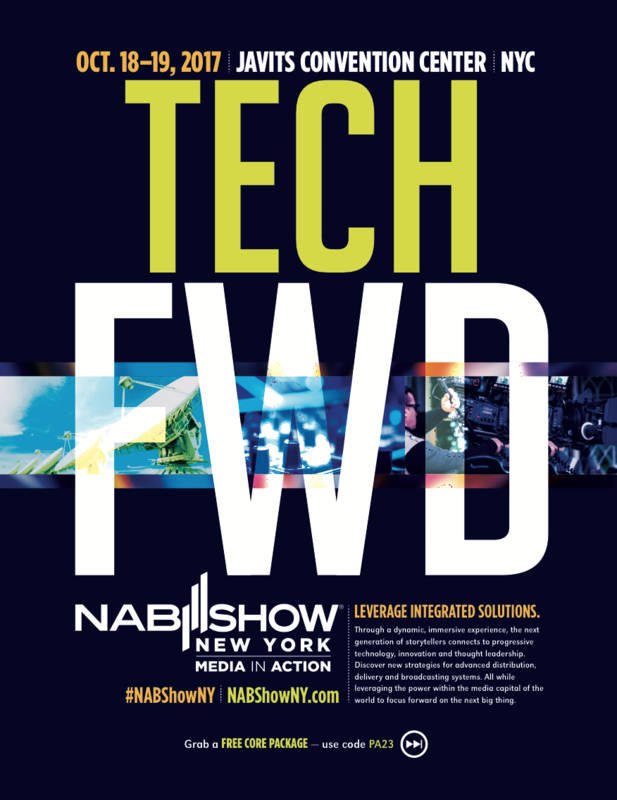 RF systems only offer data rates in the Mbps, while optical comm systems offer data rates of 10 Gbps or higher. For smallsat operators looking to deploy EO or sensing missions, this improved capability offers the potential to downlink all of their data generated on orbit, without on-board compression or complex priority tasking. However, ground station site diversity is essential for optical communications to be a viable operational system, which is the inspiration for the BridgeSat OCGN. The BridgeSat OCGN is structured around a minimum of ten Optical Ground Stations (OGS) that are strategically located in secure, low cloud, high elevation sites around the world with good access to terrestrial data lines. These sites use spatial diversity with high latitude and equatorial locations to provide maximum availability for both ISS and polar orbiting spacecraft’s. 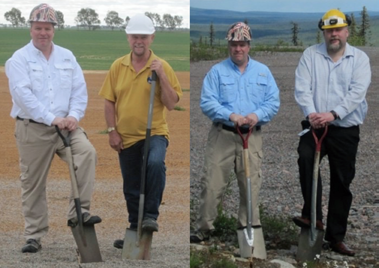 Ground Breaking at BridgeSat Sites in Australia and Sweden. Photo is courtesy of BridgeSat. 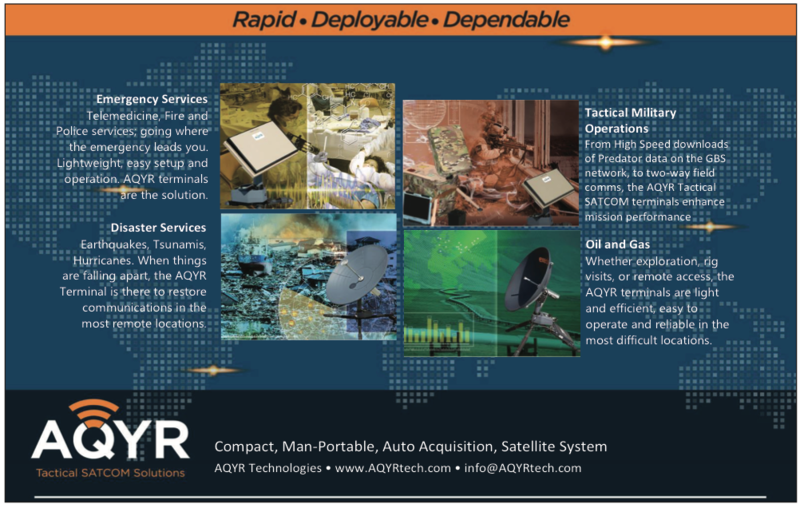 • A data modem designed to handle downlink data rates of up to 10Gbps from satellites that host a compatible laser communications terminal, including an Advanced Optical Link Protection (AOLP) system designed to minimize atmospheric effects. • A data cache storage and management system that receives the data downlinked from satellites through an Ethernet stream protocol, and provides the data line connection. • A scheduler engine that creates validated, de-conflicted, optimized schedules for any type of tasks, resources and physical or virtual constraints. • A BridgeSat scheduler application programming interface (API) will be used to integrate scheduler with other subsystems via a proprietary Weather Interface Module, Data Buffer Interface Module, Laser Deconfliction Module and Automation Module. • A network/cloud domain that utilizes a Ground Terminal Server (GTS) with the Aspera client software, which will be scheduled with inputs from the Resource Management Server (RMS) and transfers data to Amazon Web Service (AWS). • Web and app-based interfaces that will be delivered to BridgeSat’s customers and provides status of their satellite’s operational state, buffer utilization, transfer rates and downlink history and metrics (start time, stop time, data transferred, completion time, and average data rates). BridgeSat’s first major milestones were completed this summer with the ground hardware and software design reviews, as well as ground breaking at the initial sites. The first OGS installation is underway at the first site high in the Sierra Nevada Mountains of California. The next major milestone is to complete a satellite-to-ground-to-cloud storage end-to-end test, which is scheduled for late 2017. This network is planned to be operational in time to support satellite missions launching in 2018. When Final Operational Capability is achieved in 2019, this network is expected to provide a minimum of 2 TB of data downlink per day for satellites in a LEO polar orbit, with much more capability believed to be possible. From there, BridgeSat aims to deploy continual ground network expansion and upgrades that will allow much higher data downlink capabilities over time, as demand dictates. Joseph joined BridgeSat in 2016 with more than 25 years of experience in Commercial and DoD satellite operations, ground system engineering and remote terminal construction. Prior to BridgeSat he led Global Ground Systems as CEO and Chief Engineer, focusing on ground system design and systems analysis for both commercial and classified DoD customers. Before that, he was the Director of Ground Systems Engineering at Orbital Sciences, overseeing ground systems, program management, design and installation and long term support for GEO & LEO missions. Joseph was a key member of the initial operations team for the Iridium Satellite Constellation and also served in the USAF specializing in operations and intelligence. Joseph holds Bachelor’s Degree from University of Maryland in Aerospace Engineering Management and a Leadership Certificate from University of Virginia Darden School of Business.